The Bible (in its English translations) contains hundreds of verses with the expression “if” and “then.” Biblical “if – then” statements are related to the commonplace meaning of words and ordinary affairs. For example, Genesis 24:8 “But if the woman is not willing to follow you, then you will be free from this my oath; only do not take my son back there.” Another example, if a witness refuses to publicly testify to what he has seen, then he shall be guilty (Leviticus 5:1). Formal logic did not come into existence until Aristotle. Logical syllogisms only go back about a century. In mathematical logic, words often have metaphysical meanings. For example, if the universe is 6,000 years old, then its diameter cannot be greater than 6,000 light years. In this logical proposition, certain metaphysical definitions are relied on without proof. 1. Time exists, although no one has ever isolated any of it. 2. Time is measurable. It is pure speculation to imagine that one can measure what one cannot detect. The Bible states that long-term events (Hebrew olam) are in our minds: Ecclesiastes 3:11. Evidently time is a mental construct, not an objective entity. 3. Clocks are useful for scaling meters, velocities and light years because clocks and orbits are linear. Our ancestors 5,000 years ago mentioned close planet passages and the shattering of a nearby planet, which the Bible also mentions. The optical parallax to the Sun has continued to steadily decrease since the the Greeks. Where is the objective evidence that orbits have a fixed nature? The notion that clocks measure time and orbits have fixed properties is based on metaphysical assumptions that are not supported by visible cosmic history. We observe ancient atomic clocks and star streams in billions of galaxies. No ancient galaxy shines with the light frequencies of modern atoms. Indeed, some very distant (ancient) galaxies shone at less than 10% of the light frequencies of modern atoms. When we observe the history of how galaxies formed, at many ranges, we observe how stars accelerated outwards as naked galaxies grew into huge growth-spirals as the light clocks also accelerated. Let’s examine the age of the earth with simple biblical logic, rather than mathematical logic. Can the universe be both old in age and young in years? The Bible repeatedly uses eon words for the Old Testament era. It also counts genealogies and king lists that only add up to 4,000 Old Testament years. If the earliest days and years were vast eons and they both gradually accelerate throughout history, then the world would have vast age, yet few rotations around the Sun. In such a world, ancient forests could grow in a summer and die in an ice age winter. According to the Bible, the Earth was divided by water (palag) during Peleg’s days. How could the continents split apart during one man’s (Peleg’s) lifetime? Ancient people believed that their early ancestors lived for eons and each succeeding generation lived for shorter durations. Jacob, in keeping with the ancient way of thinking, said that his days and years were shorter and worse than the days and years of his fathers. Genesis 47:9. Are ancient calendars linear records? The earliest calendars had 360 days with 12 – 30 day months, which is the calendar Noah used during the flood. Later, the nations seemed to have suddenly abandoned the 360-day calendar for one with 365 days. Then the lunar calendar changed to 12 lunations in 354 days, eleven days short of the solar year. The ancients adjusted their dynamic calendars to fit the changing cycles of nature. Calendars in that era were not for measuring time. They were for adjusting life to the continually changing cycles of nature. They saw never ending changes in the very places scientists claim to measure constants. Our ancestors, a few hundred generations ago, mentioned catastrophic planet passages and a planet shattering, which are also recorded in the Bible. Indeed, we find thousands of shattered planet pieces (complete with volcanic and sedimentary rocks) orbiting between Mars and Jupiter. If planets passed sufficiently close, the Earth would precess during the passage. The Sun could appear to swinging to the north and then back to the south, as the Greeks recorded when Phaethon fell in the Baltic north. Joshua recorded that the Sun delayed in Gibeon and the Moon persisted over the valley of Ajalon during a long day. The earliest record of a planet’s orbit, the Venus Tablets of Ammizaduga, record a synodic cycle remarkably different from the modern Venusian orbit. The tablets suggests a much smaller solar system. For two thousand years, astronomers measured, with angles, a decreasing solar parallax, as though the solar system was gradually expanding. The optical solar parallax has continued to decrease even since the 1960’s when the canonical AU was established by clocks and radar. Job used the dried Mediterranean sea as a marker for the duration of life during the dinosaur age (Job 14). Indeed, drill cores confirm that the Mediterranean dried eight times, leaving thick deposits of plankton alternating with layers of rock salt, stromatolite and gypsum. He also mentioned how their faces (paniym) doubled (shama) before they died. If we lived for geological eons, our skulls would grow Neanderthal brows. This skull of a Neanderthal old man was found at Gibraltar and is from Wikipedia uploaded under a CC by SA 3.0 license by AquilaGib. Neanderthal children, however, who died as infants, had modern looking skulls, as the fossils show. Some wag might insist that accelerating days and years require a logical reason. The records of the ancients is not enough nor are their fossils. We observe that the visible properties of matter keep changing throughout cosmic history, as one should expect from Romans 8:21 (that the creation is enslaved to change.) We also observe, when we compare the shape of galaxies at many ranges, that the star streams continued to accelerate outwards as galaxies spread out and grew. It is reasonable to accept that the visibly changing properties of matter caused the outward accelerating orbits. Wait, says the skeptic, even if this were to occur in galaxies, what could cause local days and years to accelerate? We observe tides from the Sun and Moon. Experiments show that the effects of the Sun’s gravity propagate at light speed. This causes the Sun to pull more on Earth’s leading hemisphere than the trailing side. The technical name for this phenomena is gravity aberration. Gravity aberration gradually accelerates both orbits and rotations. It also causes all the planets to accelerate outwards, producing logarithmically increasing distances between the planets. Every old person remembers that days and years were slower during their youth. The age of the universe is not a problem for Changing Earth Creationists. We use biblical logic, not mathematical logic, to accept what our ancestors recorded, what the Bible states and what we confirm in visible cosmic history. Changing Earth Creationist’s reject the idea Peter predicted for the last days – the notion that all things that exist remain the same. Logic itself fails in a universe where every atom changes as it ages. 1 + 1 would always equal 2, but all ancient 1’s would be unlike modern 1’s. A universe where matter changes as it ages, the cosmos could have vast age, yet the Earth could have orbited the Sun only 6,000 times. We confirm this is so because we observe in cosmic history how the atomic clocks accelerate along with the outward accelerating star streams in billions of ancient galaxies. 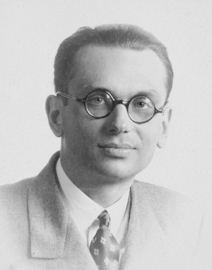 The picture is of Kurt Godel, a mathematical logician. His fame comes form his “proof” that any sufficiently complex system of mathematics that starts with axioms and develops rules, must be either incomplete or inconsistent. Furthermore, one cannot prove the system from within itself. Creation does not use syllogisms, just Moses’ Hebrew words. His creation account is confirmed in how the stars continued to come out from billions of ancient galaxies that were originally compact and naked (unformed, without starry appendages) as he described in the literal text of his creation account.